UPDATED: Sat., Sept. 1, 2018, 10:22 a.m.
CHEMNITZ, Germany – Emboldened far-right activists in Germany hope to make a Saturday protest a pivotal event that brings clusters of nationalists – from lawmakers to Hitler-saluting skinheads – together as a nationwide anti-migrant movement to challenge the political establishment. Several groups scheduled rallies in the city of Chemnitz over the Aug. 26 killing there of a German citizen, allegedly by migrants from Syria and Iraq. The largest groups have invited concerned citizens to join them later as they converge for the first time, hoping a broader far-right drive emerges from their display of unity. Counter-protesters organized a rival rally that could test authorities’ ability to keep the peace. The opposing camps confronted one another in Chemnitz on Monday, and scenes of vigilantes chasing foreigners in the city’s streets have shocked people in others parts of Germany since then. The increasingly open displays of anti-migrant sentiment and violence reflect Germany’s ongoing effort to come to terms with an influx of more than 1 million refugees and migrants seeking jobs since 2015. The right blames Chancellor Angela Merkel’s decision to allow in hundreds of thousands of asylum-seekers from war-torn countries like Syria, Iraq and Afghanistan for multiple problems. Some far-right supporters argue that migrants are responsible for an increase in serious crimes, especially attacks on women. The anti-migrant sentiment has been particularly strong in Saxony, the state where Chemnitz is located and traditional strongholds of two groups that are seeking to launch a nationwide movement Saturday night. The Patriotic Europeans Against the Islamization of the West, or PEGIDA, has held weekly rallies in Saxony’s capital of Dresden for several years. The far-right Alternative for Germany party, or AfD, received almost a quarter of the Saxony vote in Germany’s national election. PEGIDA’s strength had fizzled in recent years while groups like AfD successfully used anti-Muslim to propel themselves into federal and state parliaments across Germany. The stabbing death of the 35-year-old man in Chemnitz six days ago provides the provincial group an opportunity to reactivate its base. The share of foreigners in Saxony remains below the national average, although concerns about foreigners committing crimes are particularly high in the eastern state. Far-right sympathizers who mostly met cautiously in a shame-marked country where displays of Nazi symbols are illegal mobilized with exceptional speed on the night of the slaying and the days after. The efficiency could indicate that support for an agenda rooted in anti-Muslim rhetoric could be rising among ordinary Germans holding concerns about their new neighbors. Local police appeared to have been caught unprepared when the slaying triggered protests that attracted crowds openly engaging in Nazi veneration and which devolved into violence. AfD and PEGIDA announced their Saturday marches would merge at some point. The two nationalist groups, who have not officially worked together before, appear to be working to build a mass of citizens who are uncomfortable with the recent pace of immigration against the political establishment. 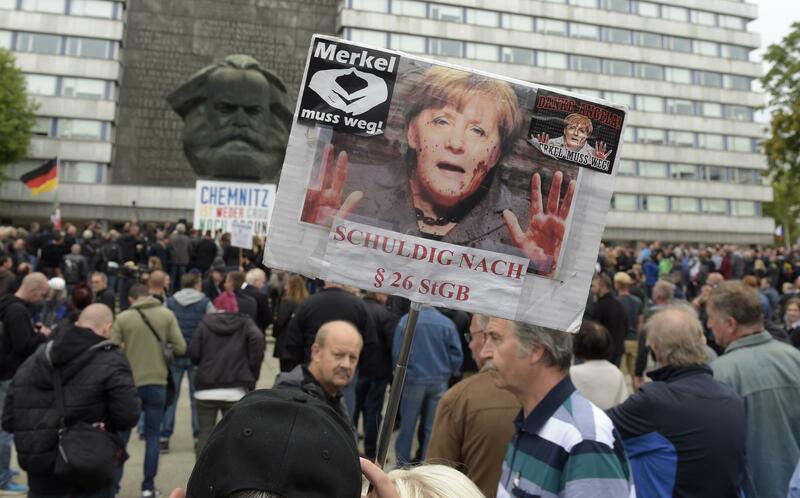 Protesters attending a rally organized by third group, Pro Chemnitz, said they would join the combined demonstration, German news agency dpa reported. Some 1,500 people marched over to the announced location of the night event while shouting “We are the people” and “Merkel needs to go,” dpa said. Chemnitz, however, has seen a comparatively weak counter-protest movement to challenge the renewed anti-migrant activity so far. The city is known for its hardened neo-Nazi scene. “It reached a level of aggression, brutality and willingness to use violence that we haven’t known before,” Detzner said. Several hundred people showed up for a “Heart not Hatred” rally Saturday afternoon that was held to oppose the latest hostility and aggression. Some 70 left-leaning and pro-migrant groups organized the demonstration. “We want it to be clear that the majority here thinks differently, not far-right and not anti-foreigner,” Lars Klingbeil, a leading member of Germany’s national Social Democratic Party, said. Published: Sept. 1, 2018, 7:51 a.m. Updated: Sept. 1, 2018, 10:22 a.m.